â€œEveryone should feel a moral obligation because it is a matter of life and death,â€ said one speaker. A â€œcall to actionâ€ was issued this week by a group of residents, environmental activists and local elected officials intent on securing the permanent shutdown of a battery recycling plant in Vernon accused of emitting arsenic and other toxic chemicals into the air, potentially jeopardizing the health of hundreds of thousands of people who live and work in the area. â€œÂ¡Ya basta con Exide!â€ (Enough already with Exide), Msgr. John Moretta of Resurrection Church said Monday at a hastily organized but heavily attended meeting at the church in Boyle Heights. The meeting was convened in reaction to a Los Angeles Timesâ€™ story that cites findings in a South Coast Air Quality Management District health-risk report that more than 250,000 people living in Vernon and surrounding communities, including Boyle Heights, Maywood and Huntington Park, faced a â€œchronic hazardâ€ to their health due to exposure to arsenic emissions from the Exide Technologies plant. Most concerning, was the possibility that children could suffer long-term neurological deficits from the exposure. Regulators and Exide officials have said the company is cooperating with orders to clean up its act. Exide officials declined to comment, but in the past have said it has significantly reduced emissions since the tests published in the report were conducted. Those assertions, however, have done little to convince area residents and officials that anything less than a complete closure of the plant is acceptable. The Boyle-Heights based Resurrection Church Neighborhood Watch hosted the meeting and has a long and storied history of fighting issues they believe will bring harm to their community. A force to be reckoned with, members of the group helped defeat a proposal to build a prison in Boyle Heights, and more recently, plans by former Vernon officials to build a mega-power plant in the industrial city. Elected officials from Huntington Park, Maywood, Bell, Compton, and representatives from the offices of Supervisor Gloria Molina and Los Angeles Councilman JosÃ© Huizar attended the packed meeting, and expressed support for efforts to stop Exide from continuing to pollute. AQMD officials have stressed that data in the report cited by the Times is an indicator of potential harm and not evidence that harm has already occurred. But many of those who spoke Monday see the shutting down of Exide as a â€œmoralâ€ imperative. Waiting around until the health risks become documented health problems is wrong, speakers said. According to Department of Toxic Substances Control (DTSC) spokesperson Sandy Nax, a hearing earlier this month was postponed because Exide has agreed to address the issues DTSC identified in its suspension order. â€œThis includes addressing the leaking pipes, and addressing risks to the community from air emissions. We also asked them to take dust samples in the surrounding neighborhood to help us address any potential exposures that occurred in the past,â€ Nax told EGP in an email. â€œWe continue to investigate the site and evaluate their operations as part of its permit application process,â€ said Nax when asked what would happen if the company complied but residents still want the plant shut down. AQMD Media Relations Manager Sam Atwood told EGP Exide has met the agencyâ€™sÂ deadline for submitting a draft Risk Reduction Plan, which he says outlines what equipment upgrades the company has made and how those changes have already reduced the risk to a level below the maximum levels allowed. Additional air pollution measures are also detailed in the plan, he said, noting that the AQMD is in the midst of a 60-day review of the plan, during which they will determine whether it should be approved. The AQMD has also started its own testing of Exide emissions to see if they really have been reduced, Atwood added. Testing includes probing multiple smoke stacks and bringing samples back to their office in Diamond Bar for analysis, he explained. Atwood said Exide is cooperating with regulators so it is unlikely AQMD would resort to the â€œlast ditch effortâ€ to seek an injunction to shut down the facility. He emphasized, however, that municipal governmentsâ€”unlike AQMDâ€”have the authority to regulate land use and can decide whether they want businesses like Exide to operate in their municipality. Vernon spokesperson Fred MacFarlane, however, took issue with that assessment on Tuesday. He told EGP that while the city can regulate some toxins emitted by businesses, certain toxinsâ€”emitted into the airâ€”fall under AQMD jurisdiction and are out of the cityâ€™s control. Vernon Councilwoman Luz Martinez, a freshman on the city council, said Tuesday she believes Exide is working toward getting things in order to stay in business. But those claims are falling on deaf ears in the surrounding communities. Where else in Los Angeles is a risk to the health of 250,000 being allowed to continue, Moretta wants to know. 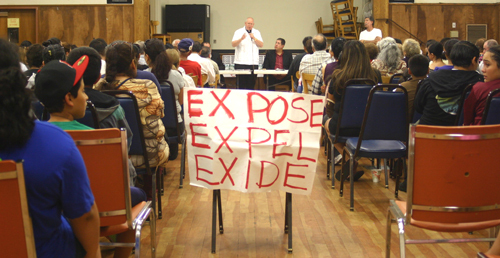 Participants in Mondayâ€™s meeting said they will develop a comprehensive action plan to shut down Exide. It will include weekly protests, letter and telephone campaigns targeted at elected officials, and unseating Los Angeles Superior Court Judge Luis Lavin who overturned Exideâ€™s closure by the Department of Toxic Control. â€œWe want to hit them on every front â€¦Â get other affected cities involved: South Gate, Lynwood, La Habra â€¦â€ City of Bell Councilman Nester Enrique Valencia said in Spanish. Activists also called for fighting on the legal front, perhaps getting the federal Environmental Protection Agency (EPA) to sue the local Air Quality Management District (AQMD). Exide is not the only polluter in Vernon, said Rafael Yarez, a local resident and environmental activist. He said residents are being exposed to other chemicals like ammonia and benzene that are being emitted by industries operating in Vernon. â€œWe have to get the EPA behind this and clamp down, not only on Exide, but also the rendering plants. There are so many issues and Exide is just one of them,â€ he said. Industry and freeway traffic pollution are a cumulative threat to peopleâ€™s health, with direct polluting sources hard to pinpoint, activist have said, acknowledging a point that is often used to deflect blame from one source of pollution as the total cause for poor health conditions, such as asthma or cancer. Regulating agencies and elected officials need to do more to protect the health of children, who are the most vulnerable, speakers said. In late August, the Boyle Heights Neighborhood Council unanimously approved a resolution demanding the South Coast Air Quality Management District and Councilman Huizar take action to permanently close the plant. Huizar got his council colleagues to back an investigation of Exideâ€™s impact on the city, as has Supervisor Molina in the county. Several people told EGP following the meeting that they believe a loved oneâ€™s health has already been damaged by emissions coming from Exide. â€œWe are already dying. That company has blood on its hands,â€ Maria Morales, 56, whose husband previously worked in Vernon and now has several serious health problems told EGP. Officials say they plan to unite in a bid to sway regulators to close a Vernon battery recycler that residents in surrounding areas say is harming their health. September 9, 2013, 10:40 p.m.
Elected officials from cities across southeast Los Angeles County pledged Monday evening to marshal their political power to sway regulators to shut down a Vernon battery recycler that residents fear is harming their health because of arsenic and lead emissions. The crowd, including several children and a woman costumed in a hazmat suit, cheered their approval. Residents and elected officials have been angered about Exide Technologies since spring, when the South Coast Air Quality Management District released a health-risk report showing that elevated arsenic emissions from the plant had posed an increased cancer risk to more than 110,000 people. Air district officials said last week that the same health risk assessment showed that more than 250,000 people from Boyle Heights to Maywood and Huntington Park faced a “chronic hazard” from exposure to arsenic, including the possibility that children could suffer neurological effects. Air district officials stressed there is no evidence that such a large number of people have been harmed, only that they could be. Exide officials, who could not be reached for comment Monday, have in the past said arsenic emissions have been reduced substantially since the high readings that triggered the health risk assessment were recorded. Nevertheless, officials from Huntington Park, Maywood, Compton and Bell said they intend to fight the plant, including holding public protests, lobbying Congress to put pressure on the federal Environmental Protection Agency to step in and even trying to unseat a judge who ruled the plant could stay open. Regulators have been struggling to address residents’ environmental and health concerns about the plant for months. When the air district first revealed the elevated cancer risk, regulators from the state Department of Toxic Substances Control moved to temporarily suspend plant operations. But Exide, which filed for bankruptcy protection this summer, appealed in Los Angeles County Superior Court, arguing that the plant did not pose “an imminent and substantial” danger to the public and that regulators were acting capriciously under public and political pressure. A judge sided with the company, saying it could resume operations. Last month, state officials announced that the company would begin testing to determine if dangerous metals have accumulated near the plant. In the past, regulators have found that lead dust had sprinkled down on rooftops and streets. Local officials said they are also exploring the possibility of testing residents’ blood to determine if dangerous substances are present.